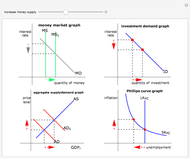 This Demonstration shows the implications for the economy if the money supply is increased. 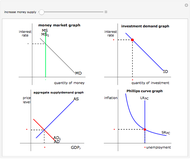 It uses the four key graphs taught in AP Macroeconomics. Initially, this change decreases interest rates, as seen on the money market graph. 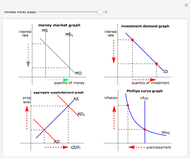 This increases the quantity of investment, shown on the investment demand graph, which increases aggregate demand. The increase in price level causes inflation and reduced unemployment, shown on the Phillips curve graph. On the money market graph, MS stands for "money supply" and MD stands for "money demand." On the investment demand graph, ID stands for "investment demand." 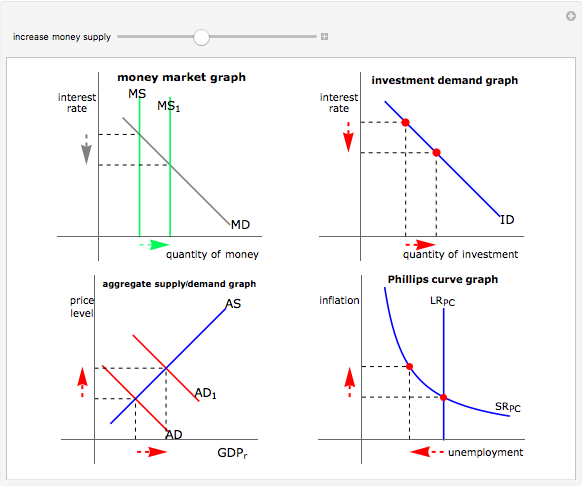 On the aggregate supply and demand graph, AS stands for "aggregate supply" and AD stands for "aggregate demand." On the Phillips curve graph, LRPC stands for "long-run Phillips curve" and SRPC stands for "short-run Phillips curve." There are a couple of caveats with regard to the Demonstration. 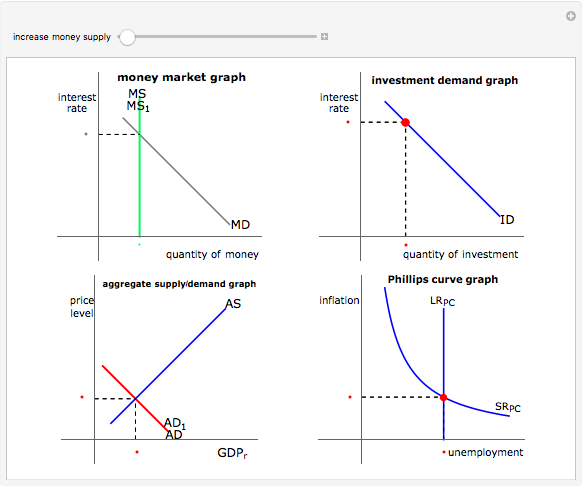 This is how macroeconomics is taught at the high-school level; however, events like the Great Depression of 1929–1936 and the Great Recession of 2007–2014 suggest otherwise. 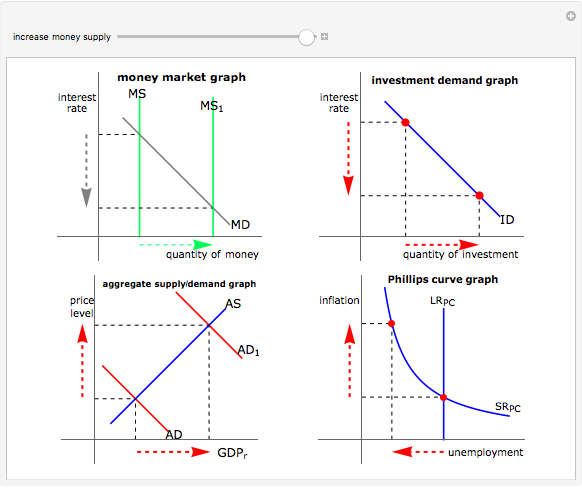 The diagrams in the Demonstration are true when the markets are at equilibrium, there is sufficient slack in employment, and interest rates are above the zero lower bound. C. R. McConnell and S. L. Brue, Economics: Principles, Problems, and Policies, 17th ed., Boston: McGraw-Hill Irwin, 2008. This was a project for Advanced Topics in Mathematics II, 2017-2018, Torrey Pines High School, San Diego, CA. Matthew Rosenfield "How Increasing the Money Supply Affects the Economy"